ST. PETERSBURG, Russia (AP) — Argentine soccer great Diego Maradona said he is "fine" after being treated by a doctor during his country's victory over Nigeria at the World Cup. Concerns over the health of one of the sport's most iconic players were revived after he needed help getting out of the stands and into an adjoining luxury box at St. Petersburg Stadium following Tuesday night's game. Alongside a post on Instagram showing a picture of himself with medical staff, Maradona said: "I want to tell everyone that I am fine, that I am not, neither was I interned." The 1986 World Cup winner said his neck "hurt a lot" during halftime of the game and that he was "checked by a doctor" who recommended Maradona leave the stadium. "But I wanted to stay because we were risking it all," Maradona said. "How could I leave?" 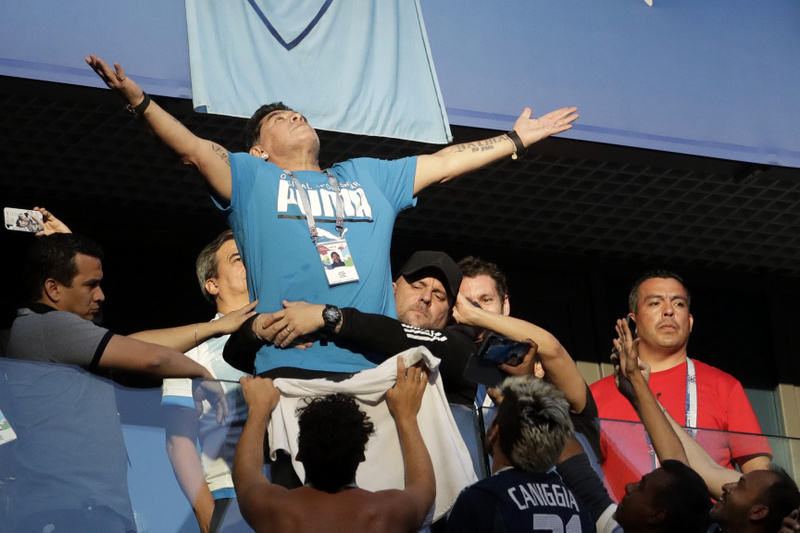 Maradona celebrated wildly as Argentina scored a late goal for a 2-1 win to earn a place in the knockout stage. He was seen on television giving a middle-finger salute with both hands when Argentina scored. Video also showed Maradona with his eyes closed for parts of the game. Soon after the match, he was photographed smiling at an airport. Another photo posted on Twitter by a Colombian television journalist showed him sitting on a plane. "I send a kiss to everyone," Maradona said at the end of his Instagram message, "thanks for the support!"